thank you so much for this! my 3 y/o is batman obsessed & i have been trying to figure out a batman logo for his winter hat! thank you! LOVE THIS. Your patterns are so fun! Thanks!! I'm glad you like them 🙂 Hopefully I'll be doing this for a long time coming! I am a little confused on what you mean by turning it upside down and on the backside. Would it be possible for you to explain it a little more in detail? I would really appreciate it. I'm trying to make this for a birthday gift. At the beginning after you chain 16, when you do the hdc, do you chain 2 extra to get the height or do you do the hdc in the 3 chain from hook? Good question! I actually forgot to put that part so thanks for asking. You don't ch any more, you just hdc in the 2nd ch from the hook. I'll fix it though! Thanks again! Hi, I'm trying to work on this and can't figure out how to do the MP stitch. I chain 2 but if I sl st into the first chain, doesn't that just make another chain? Well no because you sl.st into the first ch you made, not into the first ch from the hook. Does that help? Adorei o seu trabalho, parabéns. I've been crocheting for 35 years and this confuses me. Maybe if you are going to write up a pattern you should learn how first. Just sayin'..
Maybe you can use your 35 years of experience to provide me some constructive criticism instead of belittling the work that I have put much time and effort into and provide for free. Just sayin'.. 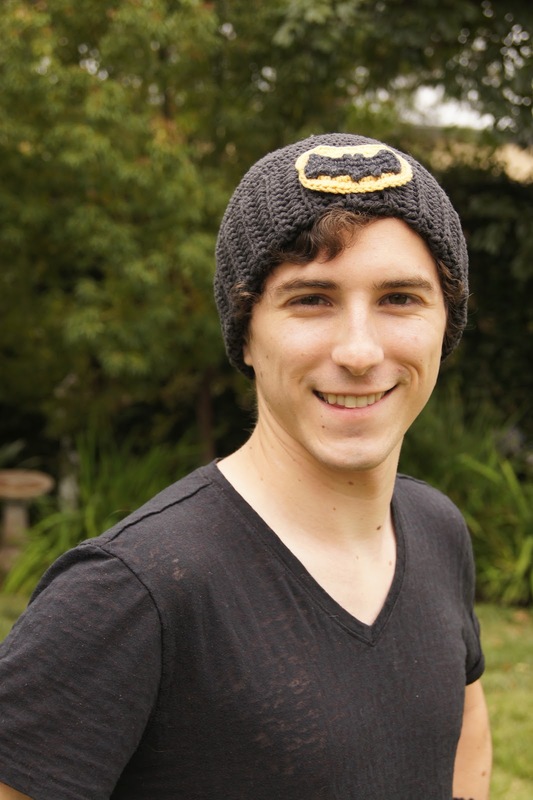 I just made the bat and am so excited to attach it to the hat that I made for my brother for Christmas. I don't see the "pattern" for the yellow oval though. Do you happen to have it available? I could do a search on ravelry or something, but I thought I would ask you first! Thank you so much for posting this pattern!! Hey Kelly! So I do have a pattern for the oval, I just haven't posted it yet. I'll post it as a new pattern for you this week! I needed to post a new pattern anyhow haha, so this will be perfect! If you want it sooner (like nowish) send me an email to [email protected] and I'll send it to you! Wow! Uncalled for Sue!! Shame on you! At your age, hopefully you would have learned manners, & the expression "if you don't have anything nice to say, don't say anything at all! And if you were having issues, your 35 years of experience should have helped you figure it out! Louis, I have been crocheting for since I was 8, & this pattern was awesome! 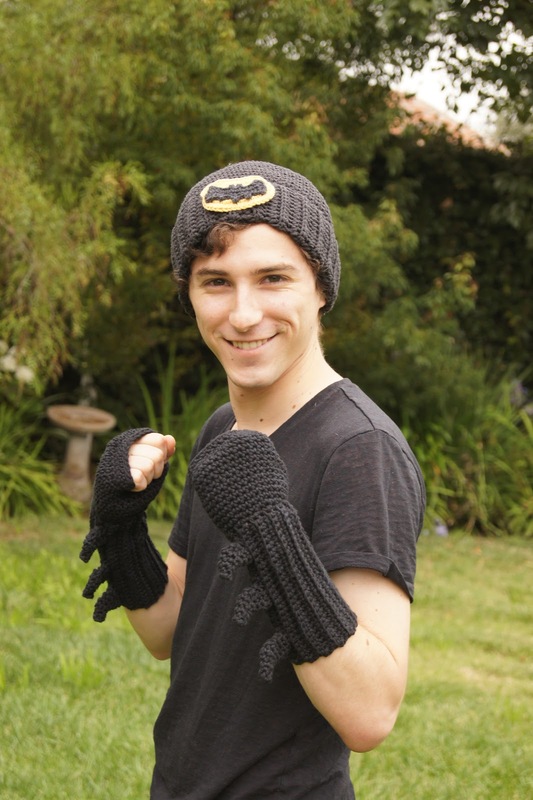 My boys love all of the cool stuff we have whipped up–mustaches, iron man gloves & batman hats! Keep up the good work my dear! I have tried this pattern twice and it still does not look like yours. I have wrote it out on paper and you have 19 stitches in the first round. I tried it with chaining 16 and then I tried it with chaining 20, it almost looks like a bat. What am I doing wrong? So I think I know what's going on. I think you're counting the m.p (mini picots) as a separate stitch and putting them in the foundation chs. For the m.ps you should be chaining 2 directly after the last st and sl.sting into the back loop of the first ch made, not in the foundation round though. If you count without those stitches you should get 14 (not including the final sl.st). I made a slight correction in the pattern to account for the 2 chs in the beginning that you skip to start (a little typo that I've never noticed until now, thanks!). I hope this helps. If you'd like to, email me at [email protected] and maybe we can figure out what's going on in greater detail. Thanks for the question and I hope this finds you well! P.S. Sorry for the delayed response. Thanks for the positive comment. It made me happy to know a fellow crocheter out there has my back. Hi, I have a question on your batman cuffs. When I get to Rnd 3-23 I am confused. It says to pull loop through first ch made – ? what chain are you talking about? The it says to sc 1 in bk st, pull loop through next ch and continue what does that mean. Did I pull the yarn all the way through the first sc, and I am starting another? Please explain what you mean, and was I suppose to connect any of these? Please help. Thanks. Sorry for the confusion. Basically, you pull through the very first ch made in the base chs before Rnd 1. You're basically seeming the cuff together here by pulling the loop through each ch made in the base and sc along the back sts in Rnd 23 as you go. Does that help? If you need more help email me at [email protected] and we can figure it out. Hi Louis, Thanks for getting back to me. Only that doesn't help, you are telling me how to connect it when I get to round 23 and I am trying to do round 3 – 24, but that is okay, I just made it all sc and it doesn't look bad. I did email you too, but I didn't get a response. I figured you must be busy or something. I am glad that you are well thank you for getting back to me. If I get confused about anything else I will try emailing you again or I will leave a message here. Hey Nancy, Sorry about that, I thought I replied to your email :(. In the pattern For Rnd 3-23 it says repeat Rnd 2, so you just ch 1 and sc 25 in the back stitches. I think you may have accidentally gone ahead or something. Sorry for the confusion! Hi,Thanks that is what I ended up doing. so I thought it meant to do the stitches for round 24 and repeat it to round 24. When actually you wanted me to repeat Rnd 2. It doesn't say to Repeat Rnd 2 on the pattern she gave me to make this for her daughter. Thanks for your help I really appreciate it. Hey I just emailed you with another question. I just whipped one of these up for my son who LOVES Batman! Thank you so much for the pattern! Thank you for the logo pattern! I've been looking everywhere for one. Came out perfect! Well, I've been crocheting for like 35 days and even I figured it out after like 15 minutes. Just sayin'..
Yikes, the manners on some people. I'd like to say thanks for taking the time to create something amazing and to share it with the world. I was thrown by the m.p. at first just because I've never heard of it, but mine came out just fine after I realized what I needed to do. Thanks again! Haha. Yah :/ sorry. Gotta make money some way so I can keep making stuff haha. My daughter saw this logo and asked me to make her a batman hat, she is in high school and told all of her friends, now there are several requests. It is awesome you can create like this. I just can't seem to properly make the logo, as i have tried many times. 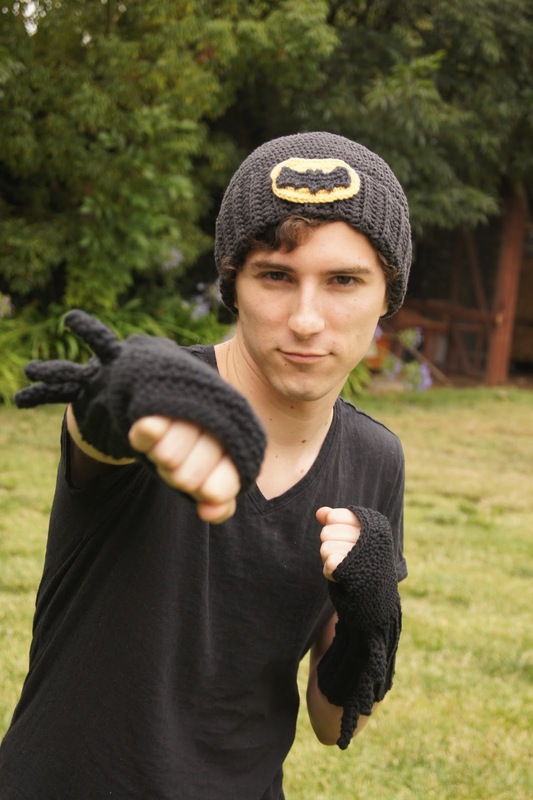 I have noticed that i am more of a visual learner and i was wondering if you could make a video of how to crochet the batman logo? Maybe on youtube, or even just contact me and send it to me directly if you don't want it on youtube? i believe it would really help me. Thanks so much for sharing this! I had to try it a couple of times to get it to look right. All of the points on mine were tilting to one side, maybe because I'm a lefty, but I added 1 ch to each picot & then minde came out okay. My nephew will love his hat! Thank you!! Thank you! I needed a pattern for the logo for my little sister. I'm making her a beanie for Christmas and this is the last thing that I needed for it. Thank you so much! 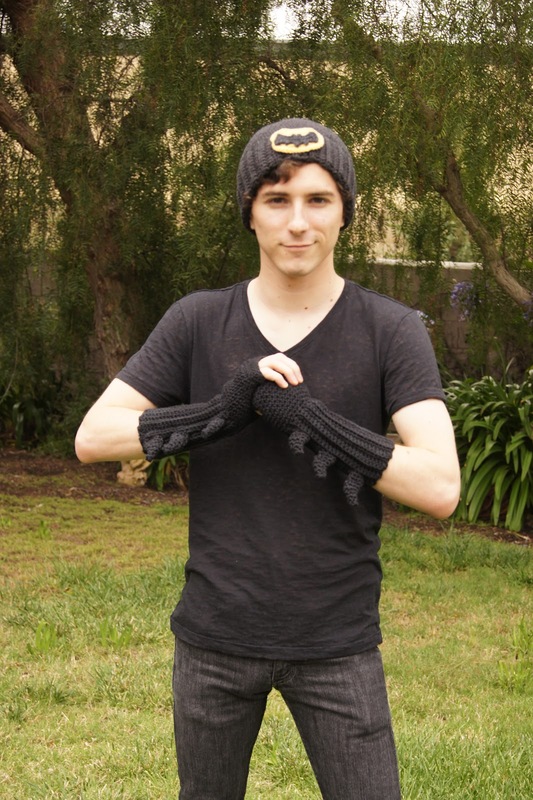 hey i know you may have answered this question…but for your batman gloves…im a bit confused am I suppose to crochet 2 cuffs and sew them together? 🙁 and then start on the gloves part? Thank you!!! Louise!!! Thank you for this awesome aplique!! You are so great I barely believe it!! ahahahha, joking. Thank you very much, this entire place is inspiring. Thankyou.